John Scranton came from England in 1637 with Henry Whitfield to found the town of Guilford in 1639. His son, Captain John Scranton (1641-1703), settled in the part of town known then as East Guilford, now Madison. Several generations later, Jonathan Scranton (1781-1847) was a local farmer, like his predecessors, and also constructed breakwaters and wharfs along the Connecticut coastline. Jonathan lived at 826 Boston Road, in the home now known as the Willcox-Scranton-Miner house (1789), where he and his wife Roxanna raised six children (two additional children died under the age of 2). 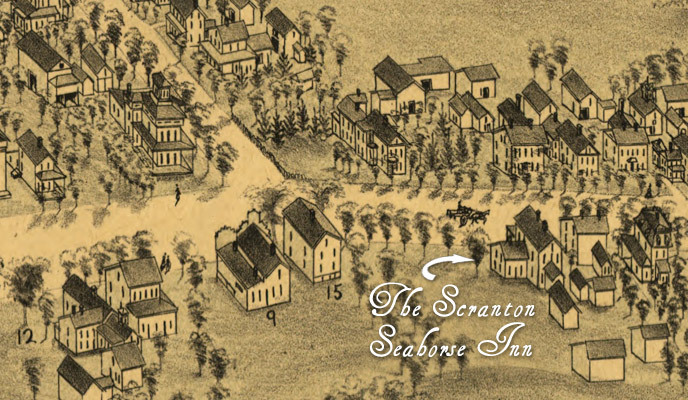 In 1833, Jonathan built a new home for his son, Sereno Hamilton Scranton (1811-1896), on the occasion of his marriage to Susanna Dowd (1814-1894). This home was built next door to his own home, and is the large, handsome Greek Revival style building now housing the Scranton Seahorse Inn. Sereno Scranton would become a prominent citizen of Madison (East Guilford) who was repeatedly elected representative to the Connecticut General Assembly and State Senate. He owned several locally built ships, one of which was captained by his brother-in-law Charles Hamilton Dowd, and was credited with creating a brisk shipping trade extending from Boston to New York that lasted many years. At one time he was president of the Shoreline Railroad and largely through his efforts, the bridge over the Connecticut River was built. Sereno and his wife Susanna had eight children, all born within this house, and he lived here until he died on January 25th, 1896. Sereno’s cousins, George Whitfield Scranton and Selden Theophilus Scranton, were industrialists who went to Pennsylvania to smelt iron ore using anthracite coal, and founded the city of Scranton. Their descendants include William Scranton, governor of Pennsylvania and U.S. Ambassador to the United Nations.